Ten of them stared hungrily at me. After three months, it all came down to this one meeting. One meeting and the opinions of the ten office zombies in this room. I needed 6 of them to agree with me in order to approve my project. The only problem:office zombies love to slaughter new ideas. I did my best to stack the deck in my favor. A dozen donuts, a dozen side conversations, and a dozen irrefutable facts. It seemed, however, the zombies found the donuts the most compelling reason for being involved. The donuts and perhaps the chance to tear my new idea limb from limb. Now the presentation was drawing to a close, and I watched our local donut troll snag the last donut and make his way towards the exit. Donut trolls tend to leave once the grazing is over. Nine left. I needed 6 votes. I began working my way through my slide deck… overview, body, summary… then the most dangerous slide in the deck. The Questions Slide. 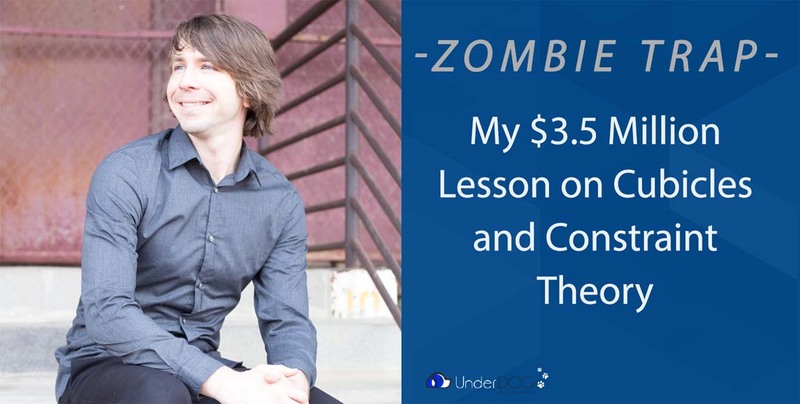 A ravenous glare gleamed in the zombies’ eyes as I clicked onto the last slide of my presentation. The questions slide created a feeding frenzy. Office zombie after office zombie attacking, biting, and trying to rip out the heart of the presentation. Question after question hurtled toward me… then the attacks subsided. I nodded toward Rosie sitting glumly at the computer. She proceeded to hand out a collection of surveys to the now-satiated undead sitting around the conference table. Mindless groaning ensued. The surveys captured the final vote. Out of my peripheral vision, I caught a squeemish zombie as he sneaked quietly toward the door. The terrifying thought of recording a recommendation with his name on paper had apparently sent him skittering out of the room. After all, if you never record an opinion, you’re never wrong. The last pen set down. The dye was cast. The zombies had voted. I held my breath in anticipation as Rosie begrudgingly collected the surveys. My wrist watch noisily ticked along. How could a building be so quiet with the groaning of a hundred employees? Oh well, it was time to escape. As the months had dragged on I had become better and better at escaping my cell. While everyone else was fighting for the next promotion and the boss’ approval, I had a different agenda. No need to waste valuable time on perception and politics. I had my life to live, and purpose to find. With no desire to stay long enough working for someone else to climb the career ladder, I could set my own internal goals. My silent rebellion provided me a refuge of sanity. This was my skeleton key. A few days back, I had hatched a new goal. Today I was going to set it in motion. My Goal: I wanted to pay back Uncle Sam every penny he’d ever given me in my job. Scholarship. Salary. Benefits. In order to do this, I had to become a one-man, cost-cutting machine. And perhaps… a little collusion with the zombie horde. That had never hurt anyone, right? To trap zombies, I’ve formed a sort of Lose Win philosophy. Regrettably to get anything done in cubicle prison, you have to capture the attention of office zombies. Be careful, with too much attention, you end up the lunch. To the average office zombie a new idea means more work with no extra pay. With these twisted incentives, even the best idea can incite a pack of office zombies to ravenous lethargy. It took me three months of effort. I corralled zombie after zombie into endless meetings. I presented my project to fellow employees, supervisors across the branch, and our zombie overlord, the department head. I call this search for stakeholders setting zombie traps. The problem is that no one wants the extra work a new idea entails, and no one wants to be responsible for the consequences of a new idea. For an office zombie, a new project means more work and more risk. However, in one-on-one conversations with a bright eyed, purpose driven, zombie killer it’s much harder to kill an idea. Once or twice during these conversations, I actually caught a glimmer of life flash across the zombie’s dead eyes. All kidding aside, the institutional no, exists outside of the individual relationships you form with people. This is the setting for my zombie trap. I offer a lose-win proposition where I accept all the work and risk, but I offer them the benefits. Giving them a stake in the idea without a burden, has proven quite effective bait. I do the work. You get the reward. Lose-win. An offer the office zombie can’t refuse. This works even more effectively if you can get the perceived authority of someone high on the food chain. In my large organization, they offered extracurricular opportunities that I volunteered for to arrange a training events for younger employees. This lateral project allowed me to rub shoulders with my boss’s boss’s boss. I used what I like to call “a strategy of perceived authority” by arranging a public speaking event where this high level executive came to speak on innovation. I planted a few good questions and wrote down all his answers word for word. After that event, I used quotes from this executive to pitch a project on innovation that allowed me to launch a think tank project that I had a lot of fun with. However, the project I was working on now was more ambitious. I wanted to cut costs, and pay back Uncle Sam (who doesn’t like very much receiving money back) for all the salary, benefits, and scholarships that had gotten me to this point in life. It took 6 months of work to bring together my cost-cutting initiative. This was the moment that all that work would earn me vindication or prove wasted effort. The pressure mounted as Rosie brought the surveys over to me and nonchalantly handed them over. She then joined the end of the line of slowly, shuffling, office zombies filing out of the room. I began counting the votes. What I didn’t realize at the time was that I was caught in a zombie trap of my own. After 6 months of work, ending in a 2 hour long super-meeting. I had my answer. When the carnage had cleared, my project was approved and eventually went on to pay 9 times the total of every cent of income, every benefit, and every college scholarship that my employer had given me. I did the math. My goal had succeeded spectacularly. Totaling up all the benefits, income, and scholarships I estimated the government had provided me about $400,000 during my entire stay in cubicle prison. At the time, I was working for the government, and I wanted to do my part to pay back that crazy government deficit Uncle Sam had racked up. Yeah, a drop in the ocean, but you gotta do what you can do. With a few months of hustle, I saved the tax payers $3.5 million dollars. That’s a $3.1 million surplus after subtracting out my life-time costs to the organization. From my perspective, that’s a massive amount of provable value that I brought to the organization. But ,,, alas they didn’t write me a check for that $3.1 Million surplus. I didn’t even get a million! Nor did I expect to. If I had owned a business, and saved $3.1 million, I would have gotten… well $3.1 million dollars. Don’t get me wrong, I was very grateful to win an award and I even received a $3000 pay-out! Trust me, that’s more recognition than usual in my particular cubicle prison! There’s a second trap in this story set by the zombies to capture me and others like me. In the rest of this article, I want to discuss the environmental constraints you face in cubicle prison. These are the constraints that took $3.1 million dollars of value and reduced it to a check for $3000. For anyone who’s read a few of my posts you probably surmised that I’m a self-improver. …at least to a point. That’s where constraint theory helps me frame the problem. Constraint theory applied to self improvement tells me that you can only continue to improve to the point that something isn’t constraining your efforts. Your personal habits can only continue to improve your circumstances up to the point that they hit a constraint that chokes off your progress. When I started off in college. I worked hard to discipline myself. I learned to schedule and track my time. I fought my sleep schedule to a consistent 7 hrs/night. I wrestled with myself to squeeze out 1-2 hours every single day to pursue my dreams. I time blocked my habits and fine-tuned my execution. I examined myself, and killed limiting beliefs. I brainstormed until it flooded. I journaled, ideated, mind mapped, and read A LOT of books. During this period of my life, my personal diligence was the constraint of my own success. At first, there was a lot I could gain by adding and fine-tuning personal habits. After training, I gradually became a lean habit machine. My personal habits were no longer getting in the way of maximizing my impact. Instead the Law of Diminishing Returns came on like an red, itchy, reoccurring, rash. It squeezed out my ability to continue growing with that same paradigm. Before I believed that with hard work and good habits I could accomplish anything. However, I came to a point where my simple view of habits failed me. During my search for the answer to break my plateau, I read an interesting book outlining a study of geniuses across multiple fields. The author came to the conclusion that the geniuses he studied achieved their success by repeatedly changing their environment to line up with their strengths and goals. The metaphor I often hear used that echoes this sentiment is a poker analogy. If you’re losing at poker, the best thing you can do might be to change tables. Environmental constraints are those insidious constraints that steal your greatness without requiring you to sleep in on a Saturday. Those are the constraints that should have haunted me during my days spent hiding from office zombies and their murderous gaze. Yet high-performing self-improvers often never even consider them. Alas, cubicle prison is full of these environmental constraints. The fact is that when you work in cubicle prison or any salaried position you’re going to experience the time constraint. My employer burned through the best 50 hours of my week making me work on a to-do list of other people’s priorities. Don’t forget drive time, off-duty emails, off-duty calls…etc. I fed my life purpose with the 10-20 hrs of left-over scraps. All-the-while, my purpose competed for time with my wife and friends while some stranger controlled priorities with the bulk of my time. No matter what personal habits you develop, if you’re working for someone else the time constraint tick tick ticks on. Time is your life’s ultimate constraint. Working for yourself you capture all the value you create. That means if I save $3.1 million, I make $3.1 million. Corporate organizations are designed to capture the value you make and push it up to the owner(s) of the business. In the example I mentioned above, with one six month project I made back 9 times the entire pay and benefits I had received for my whole stay in cubicle prison. That means my total value to the organization I worked for was likely more than 10 times the value of my pay. Probably much higher. Even if I earned back 100 times my pay, the best I ever got was incremental progression. A promotion here, a pay bump there. In cubicle prison, you’re never going to see the true value you create show up in your pocket. It’s hard to count the thousand small constraints that each employee unconsciously accepts, but together they create a powerful barrier in your life. What I mean is all the small things add up. The corporate zombies that make the collective decisions for your office remove 1000 small choices from you and often make them in bulk on the single variable of cost. Where you work. How you work. The people who you’ll spend your life with. How your offices are decorated, painted, and staffed. What you can and cannot spend company resources on. What you can and cannot talk about at work. When you can take a break. When you can work out. The chair you sit in, the computer you type on, the carpet that decorates your office, the doctor who examines you… and on and on. That’s how I ended up in an office made up of a 5’4′ gray cubicle, surrounded by skin-colored paint, and sharing space with people 30 years my senior who never talked to me. Trust me, these were not the choices I would have made. Compare that to my life as an entrepreneur. Well, ok. My wife has the final say on paint color, so not all the choices are mine. Come to think about it, I think she chose my office chair… but that’s beside the point! What are the opportunity costs that you’re paying every day to work for someone else? The sandbox you play in has a boundary to it. No matter what you do with the sand inside the box, there’s simply not enough to create the pyramids of Egypt. Corporate and government jobs create constraints and limit your flexibility to impact the world, maximize your enjoyment, and find meaning in your life. This dynamic is why I believe that there is a better option for you. For ANYONE. Not an entrepreneur by nature? Make friends with one. Forge a partnership and sculpt your dream life! Join a group of investors flipping houses. Build up passive income. Save your money and invest. Find your place in the world. NEVER, enter a room full of office zombies without a box of donuts. Do you have any stories of zombie traps and constraints that you’d like to share? Drop me a comment! I’d love to connect.